Psypoke - View topic - If you were a Gym Leader? If you were a Gym Leader? If you were a gym leader what type gym would you run and who would be your pokemon? No 'Variety' Gyms you have to run a 1 type gym. I would either be a Water or Fighting Gym. I couldnt decide because Blastoise is my all time favourite and always will be but then 3 out of my top 5 are fighting type so it would make sense if i were a fighting gym as well. And as you can probably tell i would be an offensive all out attack type gym leader that has taught his pokemon moves to counter weaknesses. Last edited by CrazyRazey on Sat Dec 29, 2012 10:10 am, edited 1 time in total. Re: If you were a Gym Leader? As you can probably see, I would also be more of an all-out attacker. Poison type, and I didn't want to make it too hard for the player. 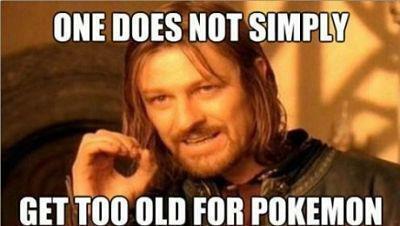 It's not competitive battling, it's in-game. Last edited by Edoc'sil on Sat Jan 05, 2013 10:58 am, edited 1 time in total. And i got one word to say to that not making it to hard...... ROLLOUT!!! Whoops, thanks. I went back to change it to Rock Slide. I think the only problem for a player doing my gym would be Crobat, since I personally would use ground types for the rest of my Gym. Crobat would evade those and then use Giga Drain. Otherwise it would probably be all right, unless they're using a ground/rock, in which case Earthquake would also pose a problem. I don't have time right now to list the move sets, but I'd totally use a bunch of Fossil Pokemon. Kabutops, Omastar, Armaldo, Cradily, Ramparados, and Bastoidon. The 5th gen ones are okay, but they don't seem so prehistoric to me for some reason. They're still cool, tho. 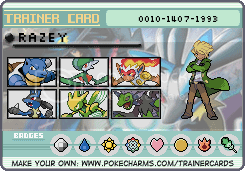 I am officially owning the Dark type gym. Not listing move sets though. A completely dark maze like gym. As you battle trainers you get a puzzle piece. All 6 puzzle pieces are needed to open the door to the Leader, ME! I am the 5th leader by the way. My badge: An oily grey triangle with a spike on each corner. It shines only in the night. I'd be... THE POKEMON CHAMPION!!! Don't you think 6 legendaries is a bit overpowered. Kind of cancels out the whole legendary thing of having only one on each game when the Champion has one. Two commanders of Earth, Water, The Sky, Time, Space and whatever Latios does. Kind of takes away the specialty of the title of legendary. Thanks GhostPony, and with all the legendaries I was just being stupid, I know not even the pokemon champion could have that many legendaries.